Reactis® V2013 is now ready for download. It includes updates to Reactis, Reactis for C Plugin, and Reactis Model Inspector. The release includes support for MATLAB R2013a, support for the new .slx model file format, a new coverage metric Multiple Condition Coverage (MCC), several GUI enhancements, test generation optimizations, export of coverage reports from the API, and bug fixes. The new MCC metric offers an even more comprehensive level of testing than is afforded by the previously supported MC/DC. MCC requires that for every decision, all combinations of condition outcomes must be observed. For example, consider the decision with three conditions: A && B && C. The MCC targets for this decision are enumerated in the tables below. The left table shows the case when short-circuiting is not used, while the right table shows the targets when short-circuiting is used (in which case an x in the table indicates the condition was not evaluated). The tables highlight the fact that many MCC targets exist when short-circuiting is not used. To be precise there are 2n targets when a decision contains n conditions. Note, however, that in the case when short-circuiting is used many fewer targets exist. In this case the number is four, which is the same number of MC/DC targets for this decision. As is the case for all metrics supported by Reactis, Reactis Tester attempts to exercise as many MCC targets as possible and Reactis Simulator offers many ways to track MCC coverage. A simple yet powerful filtering mechanism lets you instruct Reactis to display all MCC targets meeting a given criterion. For example, you can specify: display all covered MCC targets where A is true and C is false. Even if MCC tracking itself is not of interest to you, this capability to easily explore the coverage of MCC targets is helpful when aiming to achieve high levels of MC/DC coverage. 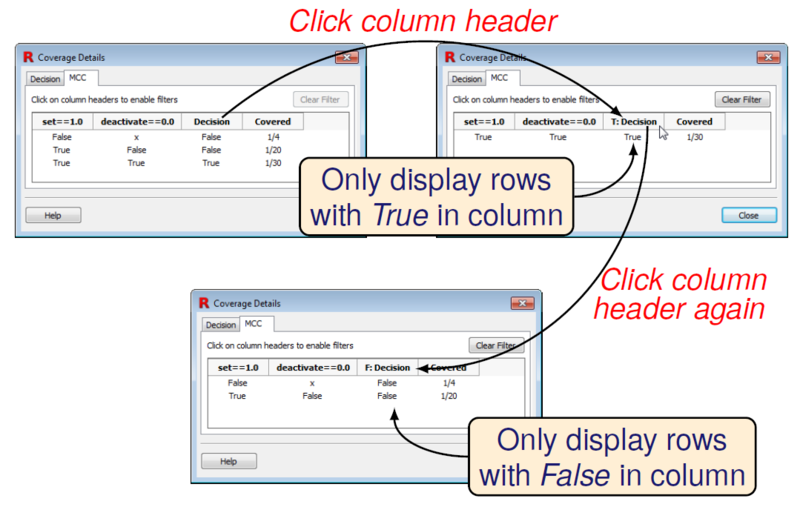 The filtering mechanism is toggled by clicking on column headers as shown below. Optimizations in Reactis Tester both improve coverage (especially for models containing lookup tables) and reduce the total number of steps in generated test suites. Note that due to the nature of the optimizations, not all models will see improvements. V2013 also includes a number of GUI enhancements that affect both Reactis and Reactis Model Inspector. 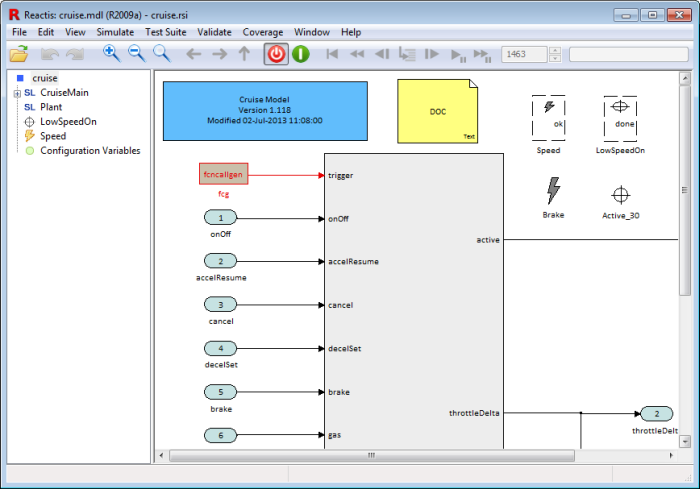 First, as shown below, Simulink block coloring is now displayed. Note that in Reactis the coloring is only shown when Reactis Simulator is disabled, in order to avoid interference with the coloring Simulator uses to convey coverage information. Second, the contents of Model Info and Doc blocks may also now be viewed. Finally, when performing a text search of a model, Reactis now also inspects the contents of Simulink annotations. Reactis Simulator offers a new feature to simplify the diagnosis of assertion violations. The feature works as follows: when a violation occurs while running a test suite in Simulator (indicated by the assertion being highlighted in red and yellow), you can right-click on the violated assertion and select Run to Violation. This will cause Reactis to switch to the test in which the violation occurs and run to the step where it occurs. Patch releases V2012.0.4 and V2012.2.2 are also now available. Release Notes. Customers with active Software Maintenance Service can download V2013 from the Reactis User Pages. Reactive Systems will exhibit at the 2013 dSPACE Ground Vehicle Technology Conference to be held October 8-9 at the Inn at St. Johns in Plymouth, MI.